If you have fruit, then you need to see these homemade fruit desserts below. Many homemade fruit pies to try too. It's that time of the year - farmer's markets are offering the best organic fruit available; that is if you don't grow it yourself. Buy some of your favorite fresh fruit and let's get started. 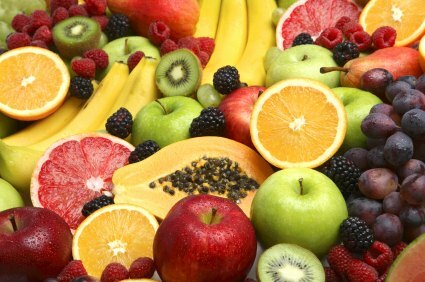 Each individual Fruit has Selection Guidelines, Nutrition, Prep and Storage Tips. 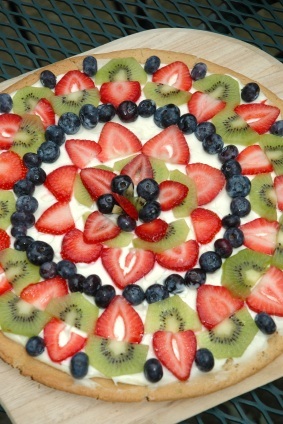 Adding more easy fruit recipes all the time, so come back and browse. Great fruit desserts too. Apple Pie, Apple Sauce, Apple Fritters, Apple Cake, Apple Bars, Apple Crisp (Apple Crumble), Apple-Banana Bread, Butterscotch Apple Pecan Cobbler, Hot Apple Cider, Caramel Dip, and Dutch Apple Pie. Old Fashioned Banana Pudding, Banana Cream Pie, Banana Cake, Nilla Wafer Banana Pudding, Banana Cream Cheesecake, Moist Banana Bread, Banana Foster, Banana Ice Cream, Banana Split Bars, Banana Split Cake, Banana Split Cupcakes, Banana Chocolate Chip Muffins, Banana Oatmeal Cookies and Banana Bread Cookies. Blueberry Pie, Blueberry Muffins, Blueberry Buckle, Blueberry Pancakes, Blueberry Liqueur, Blueberry Vodka Martinis, Blueberry Margaritas, Blueberry Ice Cream, Blueberry Sauce, Blueberry Preserves, Blueberry Cobbler, Blueberry Bisquick Muffins, Blueberry-Banana Bread, Blueberry Bread, Blueberry Salad, Blueberry Cake, Blueberry Cheesecake and Blueberry Coffee Cake. Cherry Cheesecake, Fresh Cherry Pie, Cherry Pie, Cherry Cheesecake Muffins and Maraschino Cherry Bavarian Cream. Coconut Cream Pie, Coconut Cake, Baked Coconut Shrimp, Pina Coladas, Pina Colada Pie and Pina Colado Dip. Includes lemon selection and tips on juicing, zesting and storage. Tons of great fruit desserts. Lemon Meringue Pie, Lemon Meringue Ice Cream Pie, Lemon Poke Cake, Lemon Sauce (Savory), Lemon Fruit Sauce (Sweet), Homemade Limoncello, Lemon Drop Martinis, Lemon Ice Cream, Lemon Whip Dessert, Lemon Bars, Lemon Cheesecake, Lemon Chiffon Salad, Lemon Chicken, Lemon Shrimp with Angel Hair Pasta. Mango Iced Tea, Mango Margaritas, Mango Salsa, Mango Chutney and Mango Ice Cream. Orange Julius, Orange Cake, Orange Pumpkin Bread, Orange Marmalade and Orange Chicken. Strawberry Jam, Strawberry Cheesecake Ice Cream and Strawberry Muffins and more. In a bowl, beat the cream cheese until it is smooth and creamy - not chunky. Put the marshmallow cream in the microwave for 10 seconds before adding it to the cream cheese. Add heavy whipping cream for a smoother consistency. In a large bowl, combine the first 8 ingredients and gently mix them together. Cover and chill for at least one hour. While it is chilling, we are going to make the Cinnamon Chips. Coat each side of the tortillas (or pita) with butter flavored cooking spray. (you can also dunk them in melted butter) Cut them into wedges or triangles. Dredge the wedges in the cinnamon sugar, and arrange on a cookie sheet. Spray (again) with cooking spray. Bake for 8-10 minutes. Let cool and serve with the fresh fruit. NOTE: You may also purchase Cinnamon Sun Chips instead of making the cinnamon chips. Simple and delicious, you can serve this fresh fruit dessert salsa with salmon, poultry, pork - whatever your little heart desires. Mix all of the ingredients together and chill. This is great with grilled food too. In a blender or food processor, mix the sugar, lemon juice, onions, mustard and salt together. With the machine still running, SLOWLY add the oil until it's thick and smooth. Add poppy seeds and process a few seconds. In a large bowl add the lettuce, cheese, cashews, cranberries, apple and pear cubes. Toss to mix. Pour the dressing over the lettuce just before serving and toss to coat. In a medium pan add the first six ingredients and bring to a boil. Reduce heat and simmer for 5 minutes, remove from heat and cool completely. 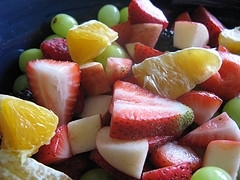 Layer the fruit in a glass serving bowl. Remove the cinnamon stick from the sauce, and pour over the fruit. Cover and chill for several hours before serving.